On 21st of April 2018 in Vinnytsia will take place opening of Fountain Roshen with music concert of groups Antitila, BezObmezhen and Hardkiss. 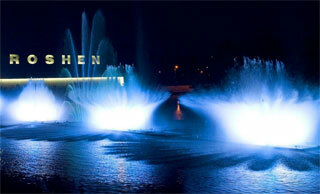 Fountain Roshen opening will be held at 19:00 in the evening. 21:00 - 22:00 - Night show with synchronization of music, projector and laser: "Little Prince", "Ukrainian", "Swan Lake", "Inventions", "Elves"
You welcome to visit Fountain Roshen in Vinnyitsia!